After thirteen and a half years as CEO, Michael Mabe will retire from STM on 31 October 2019 at the conclusion of the organisation’s 50th birthday year. Read the full announcement. The RA21 (Resource Access for the 21st Century) project is pleased to announce the opening of the public comment period for the draft NISO Recommended Practice on Improved Access to Institutionally-Provided Information Resources, the core output from the initiative. RA21 is a joint STM and NISO multi-stakeholder initiative, working to simplify the Single Sign-On access route for users of subscribed content and services when outside institutional IP domains, while ensuring user privacy is protected. To download the draft document or to submit comments, visit the NISO Project page at: https://www.niso.org/standards-committees/ra21. All input is welcome and encouraged. The Wellcome Trust, UKRI, and the Association of Learned, Professional & Scholarly Publishers (ALPSP) have commissioned Information Power Limited to explore a range of potential strategies and business models to support learned society publishers successfully transition to open access (OA) and align with Plan S. A broad spectrum of feedback is sought to help further develop the paper and continue to advance engagement. STM has submitted comments to cOAlition S on the Plan S implementation guidance. Read STM's submission. On March 5, STM ran a webinar on COUNTER COP Release 5. The recordings of the webinar can be found here. Don’t miss this if you are responsible for data analytics and platform development. Sales, business development and anyone who uses COUNTER Reports with library customers will also find this invaluable, especially the use cases. On 21 January, STM ran a webinar on a new project for a Shared Infrastructure for Transparent and Transportable Peer Review.This is an initiative by Digital Science, SpringerNature, Cambridge University Press and Taylor&Francis, supported by ORCID and Katalysis.Links to the recordings of the webinar and the slide set are available here. A survey carried out by the Think. Check. Submit. initiative has revealed a strong demand from both researchers and librarians for guidance about where to publish and an appreciation of the services that the initiative offers. However, it also revealed a need for further educational resources and wider reach for the initiative. Read more here. STM read with interest the implementation guidance for Plan S. We share the aspirations regarding advancing Open Science and Open Access expressed in the Aims and Scope and look forward to working with the signatories to ensure that its practical implementation maintains the quality of the scientific record and preserves both author choice and the ability of researchers to collaborate internationally and across discipline. Our members will be meeting with the originators of the plan on 6 December and look forward to discussing it and working with them to make sure it can. Whilst the New Scientist’s article ‘Time to break academic publishing’s strangehold on research’ legitimately notes that “…good journalism does not come free”, it fails to observe that open access itself is not free. Publishers add value and this value must be paid one way or another. Indeed, all models of publishing have a value chain - costs are incurred to ensure the overall viability and integrity of the scholarly record. Similarly, within the Gold open access model whilst readers browse at no charge, the author, their funder or their institution pays for an article publishing charge. Most publishers now offer open access options and publish open access journals, but they also fully support the broader open science agenda. A wide provision of services which enhance open access, open data, research metrics, augmented collaboration, inclusivity and transparency already exist and continue to be developed and invested in. As policymakers and research managers would agree, publishers are constructively engaged with all stakeholders in making the transition to open access a reality. STM recently ran a webinar on the Distributed Usage Logging project (DUL) you can viewa recording of it on our Webinars & Presentations page. Robert Kiley, Head of Open Research, along with colleagues from the OA Policy Review Group will explain Wellcome's new OA policy at an open session on Monday 5th November (215, Euston Road, London NW1 2BE). If you are interested in attending this briefing session, please send an email to Diego Baptista (d.baptista@wellcome.ac.uk) by the end of Thursday 1st November. If you are unable to attend, but would like to nominate a colleague, please do so and ask them to confirm their attendance. Recognising that this time will not be convenient to everyone please note that Wellcome will also be running a webinar on their new OA policy, sometime in November. If you are interested in attending that, please let them know and they will send you further details in due course. STM has appointed Andrea Powell as STM Director of Outreach and Publisher Coordinator of Research4Life following the departure of Richard Gedye after 8 years in the role. Andrea will commence her new position on 1 November 2018. Read the announcement here. There is a delicious irony that George Monbiot’s piece against publishers being paid appears in The Guardian where every download has a pop-up note for donations. Publishing isn’t free, as The Guardian’s publishers know, it also isn’t research. Much research worldwide is indeed paid for by governments on behalf of the public but funding that research is not the same as paying for publication. Funding pharmaceutical research doesn’t mean free drugs, and paying for the Olympics in London didn’t mean free tickets. Subscription science journal publishing was invented by Henry Oldenburg in 1665 (not Robert Maxwell in the 20th Century) and today provides an ever growing raft of services: secure online platforms for 100% of science journals, an article interlinking system that works, abstracting and indexing, more content available to more people than at any point in human history. Could things be better? Of course, but that requires investment, and that requires payment. Paywall: The Movie raises a range of interesting points about scholarly publishing. It states that access to research in poorer nations was an issue to be resolved so we would like to draw attention to an important initiative. Over the last 14 years the STM Association has supported the Research4Life collective, a partnership of five UN Agencies, Yale and Cornell University Libraries and the STM publishing community. The Research4Life initiative makes content from nearly 20,000 journals, 69,000 books and 120 other information resources available to 118 of the world’s poorest nations. Research4Life is acutely conscious of the need for local support in the use of these resources which it delivers through its training programmes, and is also aware of the need to not overwhelm local publishing initiatives within the countries served. There are numerous testimonials to be found on the Research4Life web-site illustrating the huge value that this philanthropic initiative has garnered. STM Statement on DSM Vote in European Parliament STM has issued a statement following today’s vote on the DSM package in the European Parliament. On 4th September 2018 'Plan S: Accelerating the transition to full and immediate Open Access to scientific publications ' was launched. STM has issued a statement on the plan which can be read here. A new webinar is available that provides an overview on the RA21 (Resource Access for the 21st Century) project. Ideal for those that are new to RA21 as well as 'old hands' - this 50 minute video provides both an update and detailed look at the current state of play of the user experience. You can view the webinar here. Over the coming 12 months, STM will take a leading role in industry initiatives aiming to both lower the uptake of sub-standard journals, as well as to promote trustworthy, high quality publications that ensure the long-term integrity of the scientific record. Read the full statement here. Industry bodies representing writers, literary translators, visual artists, journalists and publishers together with collective management organisations have come together to call on European policymakers to future proof educational practices by not allowing for the unremunerated and unlimited copying of published content. Read about the campaign here. RA21 aims to promote a modern, standards-based access management system that preserves patron privacy & control. It is important to dispel some myths about RA21 so we can move on from the outdated world of IP-authentication. Read the full article on the Scholarly Kitchen. STM published a position paper on Text and Data Mining: Building a healthy and sustainable knowledge ecosystem for Europe. The document can be found here. As part of STM's How Can I Share It? initiative, an infographic on the publication process and article sharing has been developed. The infographic shows how the production of a paper is a journey that involves a variety of individuals and organisations, from researchers and reviewers to editors and publishers. It also highlights the sharing options which are available to researchers at various stages of the process: www.howcanishareit.com/shared-journey. www.howcanishareit.com has launched in beta version to provide practical information to help share subscription articles quickly and easily. Following the completion of STM's community-wide consultation, a revised version of the principles has been released. The SCN webpage includes the new principles, an explanation of the changes made and details of the project working groups' next steps. Visit the SCN page here. On April 12, at a well-attended STM US Conference in Washington DC, STM launched its newest edition of their annual Tech Trends future forecast. 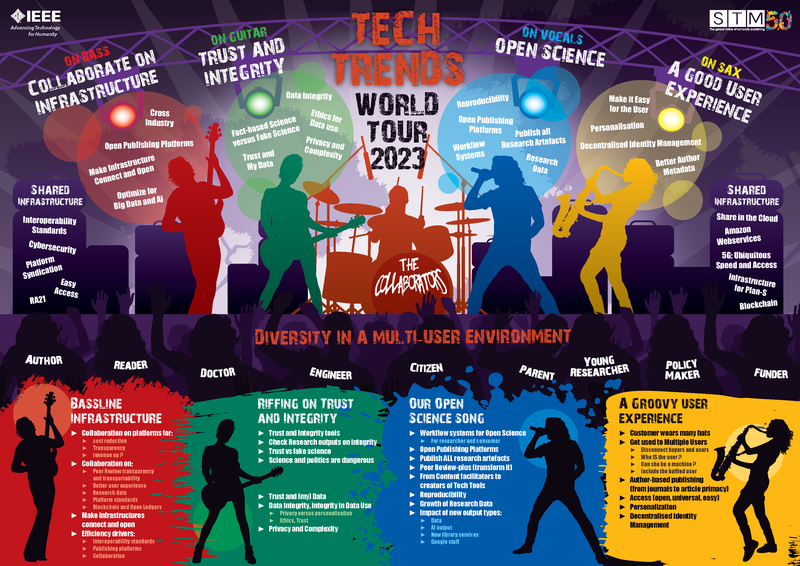 This year, STM Tech Trends takes you on a world tour with the rock band The Collaborators, featuring their chart-topping hit: Open Science Song. This year’s Tech Trends focuses on cross industry collaboration to improve scholarly communication and ensure trust and integrity in research. In a multi-user environment where diversity is the norm, everyone can tune in! STM has launched the latest version of its popular annual TechTrends series. The 2022 edition entitled ‘Entering the AI Era, Creative Humans & Smart Machines’ depicts a segmented human brain which highlights the different impacts and opportunities that artificial intelligence has for the world of scholarly communication and STM publishing. Inside the brain, human brain tissue merges with circuit boards. Outside, there is a myriad of new developments and challenges across the research and science ecosystem that STM publishers are facing. The overall theme which the illustration conveys is that by applying artificial intelligence techniques, humans and machines can work collaboratively to jointly enhance many information and communication processes. STM is committed to support its members in North America. Click here to for your North American key contacts, support and information to support your publishing house. ConTech 2018 – Conference chairs to meet to finalise this year’s programme.